It’s 10am on Tuesday morning and Katie Lance is already drinking. But it isn’t anything to worry about. In fact, it’s a celebration. 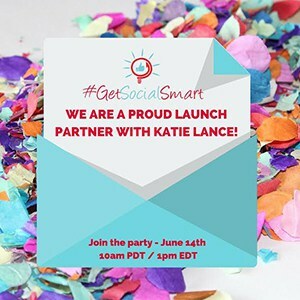 Katie is launching her brand new #GetSocialSmart Academy. “The biggest thing that’s ever happened to our business is happening right now!” she announced. 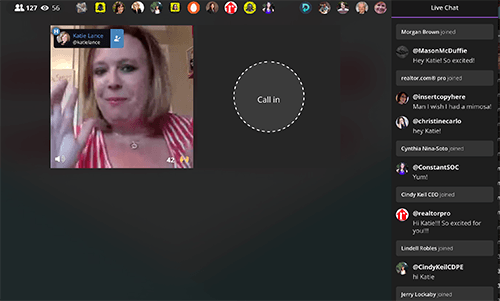 She was live on not one but three social streaming platforms: Blab, Periscope, and Facebook. It might be a world record, but that’s unconfirmed. The announcement started with a shout out to her team, a powerful group of super smart people who have helped Katie build out her consulting company and drive the new launch. Oh, and her husband. Then Katie gave serious love to her launch partners. Adwerx is one of them, and we couldn’t be happier to partner with Katie on this new endeavor. Other partners include our friends at Contactually, Deductr, Happy Grasshopper, Mason McDuffie Mortgage, Inman News, SmartZIP, Lab Coat Agents, Fidelity National Title, and HomeKeeper. Oh, and there were mimosas. For Katie, at least! Real estate is personal, which is why Katie loves the industry so much. “It’s almost a sacred experience,” she said. Katie’s new launch is created for the agent that understands the value of showing up and providing excellent customer service. Because, after all, time is precious. And helping real estate agents manage their time, and be smarter about what they spend time on, is Katie’s mission. For three years, Katie has been consulting with agents and brokers on becoming social smart. And 97% of her clients said they’d recommend Katie. The Academy takes the best of what Katie has learned in her consulting. The coaching program was a 6-week program, but Katie and team wanted to do more. The Academy is a 24/7/362 on demand library with videos, downloadable materials, and the complete 6-week social media coaching program. The Academy works on across platforms. And new content and exclusive webinars will be rolled out every month. 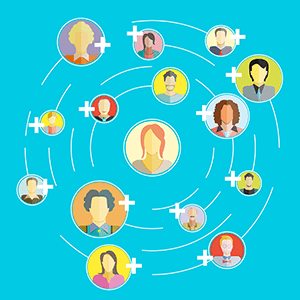 Members will have access to the private Facebook group. For two weeks, between June 14 and June 30, members can use the Early Bird Special for $47 a month (use code ADWERXMONTHLY), saving you $50 a month, or $470 a year, saving you $500 a year (use coupon codeADWERXYEARLY). And the really amazing news? You can lock in that rate for the life of your membership. And if you want to preview before registering, simply walk through the screenshot of the portal. As a partner of the launch, Adwerx provided two lovely little gift baskets so Katie could share the love with her subscribers. Other than a minor Periscope hiccup, the launch went swimmingly. And the mimosas looked delicious!